Join us for a unique opportunity to run a 5k, 10k or Half Marathon at the world famous Aintree Racecourse, best known for annually holding the world-famous Grand National steeplechase. Each Mile will be accurately marked out and we have plenty of helpers to keep you quite literally on track and encourage you on your way to that chequered flag finish. Included in your entry fee is a themed medal, event t-shirt, water and post race goodies. Come and enjoy the day with us; we hope to see you there! 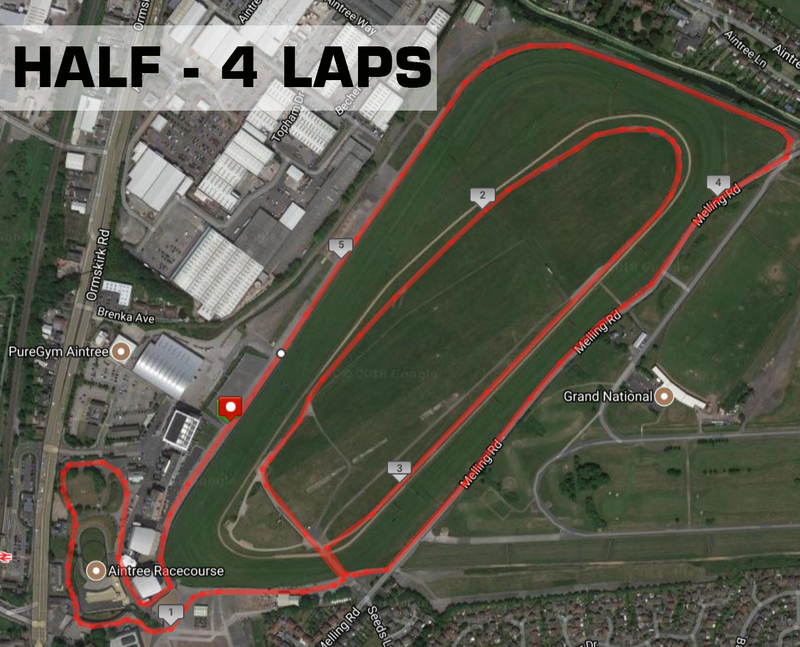 The entire course is inside the Aintree racecourse on the roads/paths not on grass. The race involves laps around the circuit, the course is flat and quick. There will be 1 lap for the 5k, 2 laps for the 10k and 4 laps for the Half Marathon. The easiest way to reach Aintree is by train. The nearest mainline station to Aintree is Liverpool Lime Street. Liverpool Central Station is just a short walk from Lime Street, where you can catch a train to Aintree. Aintree Station is directly opposite the racecourse. Use the route planner at www.merseytravel.gov.uk/journeyplanner, to find out train times. From South Leave M6 at J21A and join M62 west. Leave M62 at J6 to join M57, follow signs for races. From North Leave M6 at J26 and join M58, follow signs for races. From Mersey Tunnels follow signs for Preston, then for A59, then signs for races. The main entrance to the racecourse via Grand National Avenue is just off Ormskirk Road (A59). For Sat Nav users, please enter the postcode L9 5AS. Aintree is home of the iconic Grand Nation, the world’s most famous steeplechase. The race will start and finish alongside the grandstand overlooking the finish line of ‘The National’. The course will follow the course around and will visit the motor circuit on the inside of the race track. Aintree also hosted 11 non – championship Formula 1 races AND Michael Jackson concluded his European Section of his Bad World Tour at Aintree. It was my first ever race. Loved it! Only thing Id recommend is a healthier food range in the grandstands. It seemed the only food you could buy wasnt exactly sticking with the healthy running theme. Battersea Park is one of Londons most picturesque parks and has been a favourite course for those wanting to run a PB! The course is totally flat, offering the perfect opportunity to push yourself to a personal best. Starting and finishing at the Parks Bandstand this course laps the park making it easy to follow and great for any spectators to catch you flying around the course.